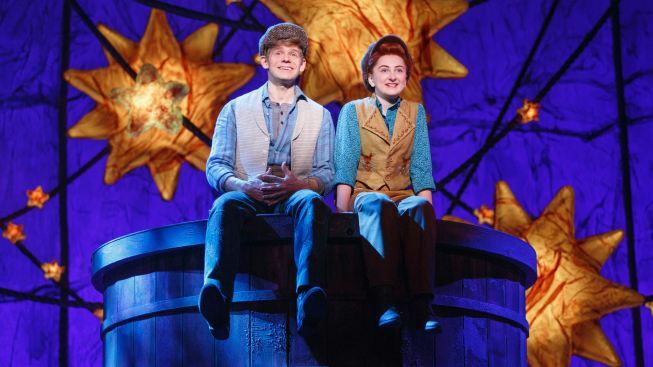 Andrew Keenan-Bolger and Sarah Charles Lewis in "Tuck Everlasting." "Tuck Everlasting," the new musical based on Natalie Babbitt's beloved novel of the same name, will play its final performance this Sunday at the Broadhurst Theatre. At the time of its closing, the musical will have played 28 previews and 39 regular performances. Featuring a score by newcomers Chris Miller (music) and Nathan Tysen (lyrics), with a book adapted by Claudia Shear ("Dirty Blonde") and novelist Tim Federle ("Better Nate Than Ever"), the family musical opened at the end of April to mixed reviews. According to numbers reported by the Broadway League, "Tuck Everlasting" never failed to gross more than 50% of its $1.1 million potential, taking in just 29% last week, or $325,361. The show was nearly shut out of the major categories of the 2016 Tony Awards — which often helps drive sales — netting only one nomination for Gregg Barnes' costume design. Casey Nicholaw, who directed and choreographed, will still be represented on Broadway by "Something Rotten!," "Aladdin," and "The Book of Mormon." "Heartbroken by the news that 'Tuck Everlasting' will play its final performance on Sunday," star Andrew Keenan-Bolger wrote on Twitter. "While our run on Broadway won't be eternal, I feel lucky to have spent it working on something I loved." "That being said, one line from our show stands out — 'You don't need to live forever, you just need to live,'" he continued. In addition to Keenan-Bolger, the cast features two-time Emmy winner Michael Park ("As the World Turns") and three-time Tony nominees Carolee Carmello and Terrance Mann.